CyberPowerPC is bringing some more competition to the mini-desktop market with the Fang Mini PC series. Just like Intel's NUC kit and Gigabyte's Brix Pro, the Fang Mini series is small enough to fit on a desk or in an entertainment center, but powerful enough for some PC gaming. The big difference is that CyberPowerPC is offering complete systems, pre-loaded with Windows 8.1, a 1TB hard drive and 8GB of RAM. Intel and Gigabyte require you to bring your own operating system, storage, and memory. It's a matter of having more choice versus having a system that's ready to use out of the box. CyberPowerPC is offering a choice between Intel and AMD chips. The Intel version costs $889 and includes a Core i7-4770R quad-core processor and Intel Iris Pro 5200 graphics. The AMD model costs $799 and includes an AMD A8-5557M quad-core processor with Radeon R9 M275X graphics. The AMD model should have a slight edge on performance (and price), while the Intel model should sip less power. Aside from CPU and GPU, both models have identical specs, including 802.11 a/b/g/n/ac W-Fi, Bluetooth 4.0, four USB ports (two in front, two in back), Ethernet, HDMI and Mini DisplayPort outputs, and a 3.5 mm headphone jack. Keep in mind that with the same processor configurations, Gigabyte's Brix costs $620 for the Intel model, and $570 for the AMD model . If you have a spare copy of Windows, or can find some cheap storage or memory, you could come out ahead on price with Gigabyte's bare-bones setup. Although the desktop PC market is in steadydecline, the mini PC is finding some growth within this category. Intel has said that these devices saw a million units sold last year, after being a non-existent category in 2012. 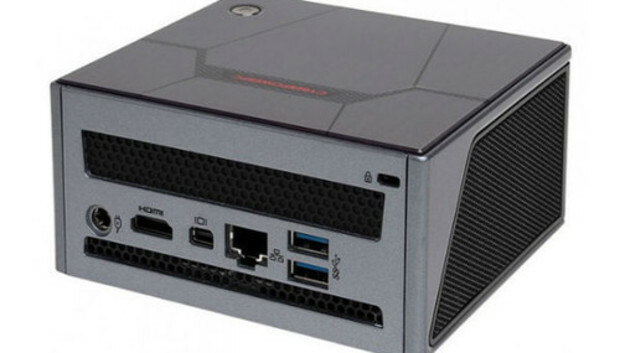 And if Valve can finally push SteamOS out the door, these tiny PCs could find some more footing in living rooms later this year.